Gutters are a critical functional component of your home and a subtle but important design element as well. When you require both for your home, Designer Gutters area a great choice. The new Designer Series Gutter from Advantage Seamless Gutters will give your home that more modern and distinguished look you have been searching for. The 6” designer series gutter will add a beautiful finished look to your house while giving you unsurpassed performance and durability. Available in two profiles, the Three Step Modern or the Colonial triple cove, the new Designer series gutter will be sure to set your home apart from the rest. Why Go With a Traditional Look When You Can Set the New Standard in Looks and Innovation? With the Designer Series Gutter you will not have to settle for the same old look, but you will not have to compromise performance. Just like the traditional K-Style gutter the new Designer Series gutter is offered in seamless .032 aluminum and has lifetime warranty brackets. Designer Gutters function just as well if not better than a traditional k-style gutters. With the added design flair you can separate your home from your neighbors with these stylized gutters. In addition, Designer Gutters are a gutter size that falls between our 6″ k-style to 6″ half round gutters. Advantage Seamless is always leading the way with design and technology that improves your home. As a local and trusted provider of gutters and gutter services in the greater Minnesota area, we can help you protect and improve the curb appeal of your home. 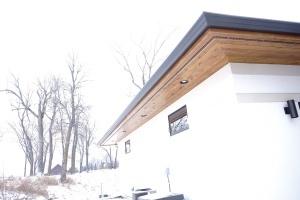 Call us at (218) 270-2663 to learn more about our Designer Series seamless gutters. Experience the Advantage today!